Over the last few weeks, the Nifty index has seen a decent double digit percentage correction. The midcap and smallcap index are performing even worse. 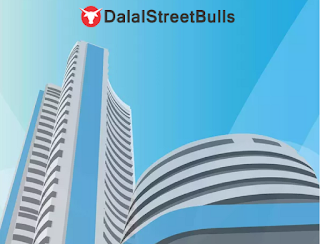 The buzz on the street is that the market valuations are at a healthy zone and it is a good time to start picking stocks. The current valuations of the Nifty 50 index are given below. The mean PE of the Nifty is ~ 19 and the index is now trading above it’s +1 Standard Deviation. The PE Ratio was at 28.55 in late August 2018. When the PE Ratio is high, the prospective returns are low even over a multi-year period. Sticking to quality stocks at low to fair valuations and a healthy percentage of cash in the portfolio can help navigate inflated valuation periods in the market. The current valuations of ~ 25x PE is still not cheap especially when the earnings growth is just 8% p.a. The market is bullish and stock prices rally as PE multiple expands. However, the returns earned over 12-18 months can vanish overnight as investors have seen multiple times in 2018. The Return on Equity is a dismal 13.17% particularly due to lower margins. For ROE to improve, earnings will have to grow. Earnings growth will come with revenue growth and expansion of profit margins. There are signs of recovery in revenue growth based on Q2FY19 numbers and also the RBI data on Capacity Utilization. An increase in the CU is a strong indication of demand picking up. 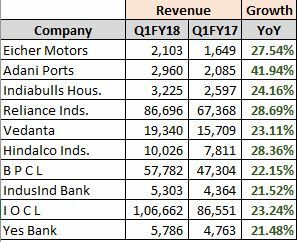 The order book growth of large infrastructure and heavy industry companies also points towards a healthy growth in revenues and earnings over the next few quarters. Even if revenues grow by 10%, the margins will have to expand for earnings growth to be > 15%. We believe that the Nifty index will return a CAGR of 8% to 10% over the next 5 years. A good portfolio of equities will still able to deliver returns of 20% p.a. and higher over the same period. Our portfolio for new investors is still cash heavy with nearly 60% of the funds deployed in cash (Check out our Live Portfolio). Most of the mid and small caps still trade at premium valuations to what they ideally should be commanding. For example, many auto ancillary companies with low pricing power still trade above 20x PE. While the market valuations cool off in a rising interest rate environment, we continue to add good quality stocks at fair valuations to our portfolio. The market correction is real. For a layman who doesn’t track the stock market, nothing has changed. The Nifty and Sensex are down just 5% to 7% which is normal for a volatile asset class like equities. But most of the portfolios in the market (Funds, PMS, retail accounts, etc) are down in double digit percentage. 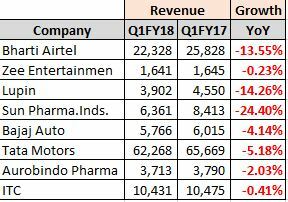 As evident from the table above, the smaller companies are bleeding. Most of the retail portfolios are heavily invested in small & mid caps. 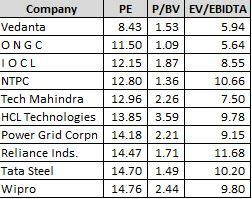 Most of the stocks below Rs 10,000 Crores market cap are down by more than 30%. More than 81% stocks are down by 20% or more. Infact, more than 50% stocks are down by 40% or more. This gives a true image of the market breadth. While the broader indices look fine, the stocks have already undergone a deep correction in value. Moreover, we believe that many stocks will never see their previous highs. In the sub – 1,500 Crore market cap space, there are many companies across different sectors. Investors should understand that not all sub – 1000 Crore companies can become Rs 10,000+ Crores organizations. Just because a company has fallen 50% doesn’t mean that it cannot fall another 50%. Investors should be careful in selecting the company to invest in. Just because a company’s stock price went up 500% the last time, it doesn’t mean that it will go up 500% the next time too! Some factors that we would be looking for – Ethical management, improving margins, sustainable earnings growth and the return on capital. Do drop in your comments about the market! The Nifty index is at 11,600. We are at all time highs but most of the investors are seeing their portfolio down from highs due to a considerable erosion in the mid & small cap segments. It is safe to say that we are now in that phase of a bull market when most stocks have stopped performing and a few names are pulling the index up. We see a correction in individual stocks as a healthy event which restores some sanity in the valuations. 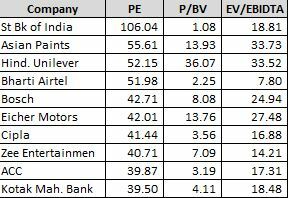 Nifty 50 – the largecap index still trades at expensive valuations [PE of 28+] with earnings growth at just 4%. Earnings growth is at a bottom and there are signs of margins expanding for companies across sectors. A big reason for the seemingly low earnings growth is the write-off’s in banking companies for the NPA’s. 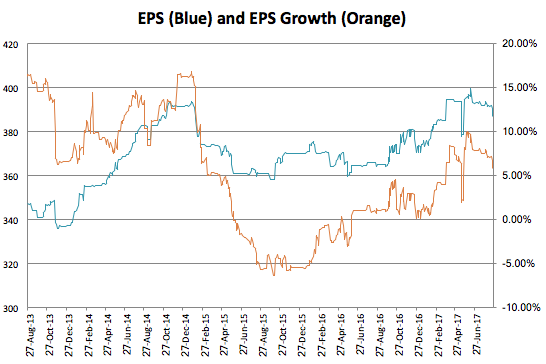 Once the NPA issue is sorted we will see a sharp rise in earnings which can cool down the PE ratio. In the past, the markets never traded at these PE ratios for long and the market sentiment was of Euphoria. There is no euphoria of the ’99 dot-com and ’07 bull markets. In our past posts we have highlighted how previous market tops were a phase of peak growth in earnings, expansion of margins and maximum capacity utilization. The earnings growth is low, utilization is subdued and we have not peaked out on various data points. However, earnings will eventually have to catch up. While we do not foresee a “crash”, we do see a time-wise correction coming in. A period of low returns and consolidation while the earnings catchup. Are earnings catching up? We see the recovery in Capacity Utilization continue over the next few quarters. CU has reached a multi-quarter high (The highest since Q415-16) and we expect it to cross 78% eventually. As CU rises, we will see a rise in capital expenditure too as companies push for expansion in capacity. Private investment has been low over the last 4 years which reflects in the low credit growth that has plagued the banking system. Credit growth has returned to multi-year highs too, in-line with increasing capacity utilization. These factors indicate a revival in spending by the private sector. We see both economic growth and inflation picking up. The PB ratio is still low because of a depressed Return on Equity. The ROE of the Nifty 50 index is 13.3% which is just above the average cost of equity (around 12% in India). We expect the ROE to inch back to ~ 17% eventually. Now, the book value of the Nifty index is 3072.27 and for an ROE of 17%, the EPS has to move up to 522 from the current 409. This is in-line with the market’s expectation of the EPS growing by 20% to 25% over the next few quarters. One has to keep in mind that the PE ratio reported by the NSE is based on standalone earnings and investors should always look at the consolidated data for a holistic view. However, we can use standalone data as a fair indication of valuations and earnings growth trend. It is tough to predict the direction of the market especially in the year of elections. The market wants a stable Government at the centre and would hoping for the BJP with 230+ seats OR the Congress with 200+ seats. In the current environment, it is easy to make mistakes and these mistakes can be very expensive. We are primarily looking for companies with strong financials, fewer red flags and visible earnings growth outlook. Also, we want to buy such companies at cheap to fair valuations. Kajaria Ceramics, Symphony, etc are examples of “high quality” companies which were trading at expensive valuations and then they eventually corrected by more than 40% in less than a year! We would rather be in cash till we don’t get the companies that we are looking for at the price which we are willing to pay. Liquid funds and short term debt funds yield ~ 7% p.a. and this seems higher than the prospective returns from most individual stocks. In this post, we will try to estimate the expected returns from the broad market indices (Sensex and Nifty) over the next decade (By the year 2027). The idea of this post is to show our readers that we are not in a raging bull market bubble and that despite the markets being at a all time high, long term investors have ample opportunities even today to make high returns! 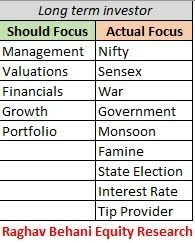 For estimating the future returns of Nifty and Sensex in this post, we will not use any fancy terms like GDP, growth, earnings, etc. We will just use the average historical returns of equities as an asset class and an assumption of broader market returns reverting back to these averages (Currently we are lower than the average). Adjusted for dividends, the broader markets have given ~ 6.5% p.a. over the last 10 years. Adjusted for taxes, this is close to FD returns and that means equity investors have got no premium for assuming higher risk! Whats worse is that we have not considered inflation as of now. Lets adjust this returns figure for the average inflation and see what have the investors made. Adjusted for inflation, investors have made less than 1% p.a. over the last decade. Now 10 years is long term and we cannot consider this as a one off case. The indices have lagged behind their historical returns and sooner or later, we will see a reversion back to the average returns. 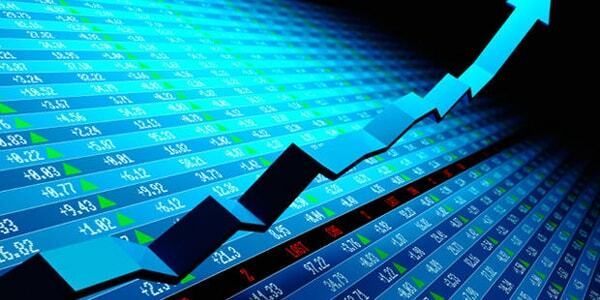 You can read our article (it is interesting) on GDP vs Stock Market returns: Click Here. The average historical returns of Nifty and Sensex have been 12% since the 1991 economic reforms. We expect this average to be maintained till 2027. Now we boil down to a simple math calculation that between 2007 and 2027 if we were to get a 12% CAGR, where would we end up? From October 2007 to October 2027, if we were to clock a 12% p.a. CAGR then the Nifty would end up at 57,646 and the Sensex would end up at 1,92,926. Now from where we are in October, 2017 this ambitious target by October 2027 would require a CAGR of ~ 19% p.a. Now if were to go and tell any investor that Nifty and Sensex can give 19% p.a. over the next 10 years, we would most probably be beaten up. After all, the worlds best investors have earned close to ~ 22% p.a. over their careers. If you think that this is impossible, then consider the 1979-1991 phase when the Sensex averaged a humongous 28% p.a. return! This is a 12 year period that we are talking of. Also, consider the 2000-2008 phase when between two market peaks, the Nifty index gave a return of close to 19% p.a. (including dividends). The above table shows you the ex-dividend returns of Nifty between two market peaks. 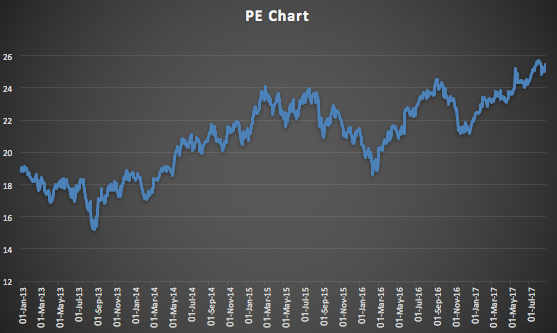 You can read our detailed article on the above table here: Nifty PE at 25, what next? So as an investor, even if you are concerned that we are at a market peak, just remember that the markets can and have historically given > 18% p.a. returns between two market peaks. 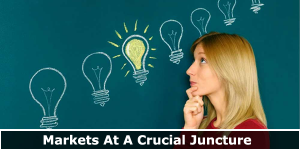 The Indian stock markets are at a crucial juncture. Why and what is the road ahead is the focus of this post. The markets have seen a big upside over the last few months and this upmove has not seen any significant correction. In a previous post, we had written of how stock prices can move up significantly without any serious expansion in earnings (Refer: 600% Gains in PC Jeweller). The same rule applies to the broader market index as well! (After all, indices are composed of individual stocks). 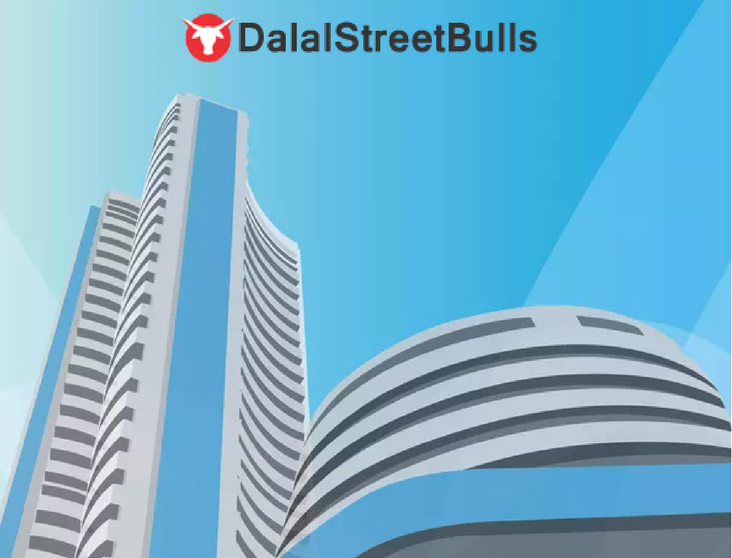 Let’s look at what has been the primary driving force behind the rise in the Indian stock markets over the last four years. We will use the Nifty index for our research. To being with, lets compare how things have changed for the index between 2013 and 2017. The above table draws a comparison between the Nifty index on dates that are four years apart. While the index itself has risen by 16.85% p.a., it’s earnings have grown at a snail pace of 2.77% p.a. (CAGR over four years). Now, the markets ideally move up when earnings go up OR when PE expands. As the above table shows, earnings have increased slower than the GDP and even slower than the inflation growth rate! There is no further room for the PE to expand. It is at historical high levels on the valuation scale and at the most we see a 10% upside solely based on PE expansion. A high PE denotes high hopes from investors and the investor community is expecting high rates of growth going forward. Earnings growth has stagnated since 2015. 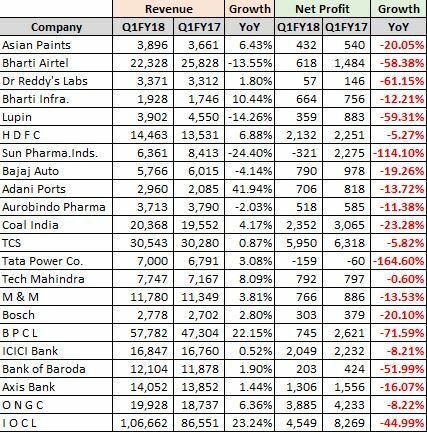 NPA Mess, Demonetisation and GST transition were dampeners for any expectations of earnings recovery, although these events were just a bump. If India’s GDP is to grow at 8% p.a and inflation is to grow at 6% p.a. then corporate earnings have to grow at 14% p.a. Earnings recovery is expected over the next two quarters. If we do not see a recovery in earnings then the premium that the market is commanding will go down closer to it’s mean (PE of 19). While we do not see any reason for a 2008 types meltdown, a ~ 12% to 15% broader market correction is possible due to high valuations coupled with no earnings growth. In 2000, the PE ratio of Nifty was 28.47. In 2008, the PE ratio once again reached a peak of 28.29! Now if an investor had invested at the dot-com peak of 2000, he still would have made 17.28% p.a. returns over 8 years! This proves that investing for the long term removes the risk of market timing. The biggest difference between 2007 and 2017 is that 2007 was the top of the earnings growth cycle while 2017 is near the lows of the earnings growth cycle. Going forward, Nifty can grow by 12% p.a. over the next 8 years if earnings grow consistently at 14%-15% p.a. and higher. Also, apart from PE, no other metric is near the 2007 valuations peak.